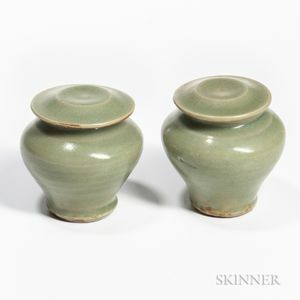 Pair of Longquan Celadon Covered Jarlets, China, possibly Ming dynasty, baluster shape on a bisque foot ring, faintly raised band around neck, the cover with flattened center with a central flange on the underside, ht. to 3 7/8 in. Provenance: Christie's East, New York, September 22, 1998, Lot 11.